Ready to Enhance and Streamline YOUR Training? If you are using Weblearning version 9 or later, you have probably noticed the ‘rich text editor’ all over the entry forms. You use it to enter quiz questions, presentation slides, course layouts, response pages, and more.Chances are, you have used it to do simple markup such as bolding the text, changing the size, and perhaps even changing a color. However, there is quite a bit more you can do with this editor (actually too much to mention in a single article). 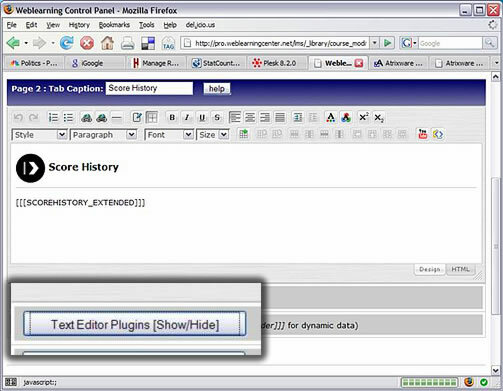 For this article, I will be focusing on the ‘Text Editor Plug-ins’ panel, and covering a few things in there that you may find useful. The general rule to follow is this. Before insterting/adding anything from the plug-ins section, make sure you position your cursor at the exact position you would like the content to appear. If you want to add a link that, when clicked, displays a popup message (like this one – click here), position your cursor in the exact place you want the link to appear (in the text area), then click the POPUP MESSAGE button (in the Miscellaneous section). Fill out the prompts. If you are authoring a quiz question or a presentation slide, and are using the navigational-style layout (where each question or slide appears on a separate page, and users navigate using back/next buttons), you can enhance the functionality by inserting links that go to the next, previous, or even a specific slide (or question). To do so, click the corresponding NEXT PREV or LINK TO SLIDE buttons, and fill out the prompts. In a future article, I will discuss some other options not covered here (I suspect it may take 5 or 6 articles to touch on everything available). If you enjoyed this article please consider staying updated via RSS. However, when authoring in the Weblearning system, it’s a bit of a pain to have to create the ‘correct answer’, publish the quiz, test it out, go back and modify the correct answer, republish, etc etc. Therefore, bookmark this article, and use the form below to test your ‘correct answer’ against the possible student answers – it will save you a lot of time. Copyright © 1997-2019 Atrixware, LLC. All rights reserved.